This was the comment I woke up to this morning on my Google Plus page. Who is Charlotte Newell? I have no idea. I looked at her Google profile and it appears that it was set up recently simply to leave a nasty comment on my post. Now why would “Charlotte” be so pissed off by this very funny video? Because every time I open my big mouth, there is an opportunity for more consumers to learn that debt relief sales people are typically not the best source of information when you are trying to figure out how to resolve your debt situation. “Charlotte” is unable to address any of the well thought out and logical issues that I raise about the entire debt relief industry and this threatens her ability to continue selling whatever it is she is selling to uninformed consumers. 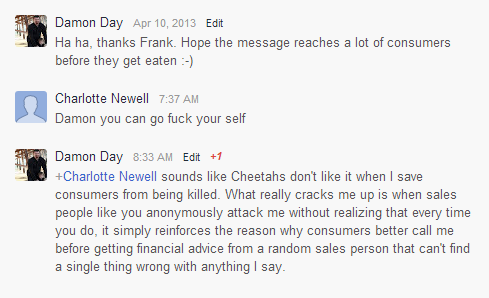 So “Charlotte” is left with no response but to drop anonymous F bombs in frustration. The beauty of her “not so well thought out” actions, is that, dropping an F bomb will get attention. It will actually cause more people to take notice, and then go to my website to find out what I could have possibly done for someone to have such an emotional and irrational reaction. So “Charlotte” I am very appreciative of your comment, and I know that all the new consumers who stumble across my website because of it will be appreciative to.